LCol (retired) Andrew Claremont “Monte” Moffat passed away peacefully in his sleep on January 18, 2017, at his home in Red Deer, Alberta. His wife Daphne and children Andrew, Trish, Kate, Chris and Ian (deceased) survive him along with 11 grandchildren – Michael, Andrew, Gordon, Geoff, Daphne, Matt, Robb, Katharine, Candice, David and Tyler and 11 great grandchildren – Jeremy, Mackenzie, Abigail, Leah, Mikayla, Calia, Jace, Andrew, Jackson, Ryleigh and Kiah. Monte was born in Moose Jaw, Saskatchewan in 1927. His first conscious memories are of the struggles during the Great Depression. 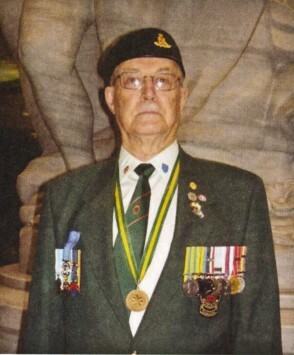 He joined the Canadian military in 1947 and served until 1977. Highlights of his military career include service in the Korean War. He instructed the OCP 60 – 61 Course for artillery officers, which resulted in a lifelong relationship with 16 graduates that formed a family that endured until his passing. He was the CO of the 1SSM Battery and wrote a book on the Canadian Government’s response to the FLQ Crisis, which was seized by the Canadian Forces. After his retirement in 1977, he and Daphne became ranchers for 12 years, establishing a Finn-Suffolk breed of sheep. During this period a number of deaths in the Caroline Alberta District were attributed to a lack of ambulance services. Monte lobbied for the province to provide the service and when they rejected his request, Monte raised the funds and presented the Ambulance to the town of Caroline. After the district refused to accept the financial responsibilities of a service they deemed unnecessary, Andrew and Daphne created a cooperative using their own money and raising funds from the community. In addition, Andrew and Daphne offered to manage the ambulance volunteer service. Andrew became the first registered EMT in the province, registration number 2, while Daphne’s number was 8. As an EMT, he and his son Chris gave First Aid and CPR classes at the local high school. He became an Advanced Paramedic at the age of 74 and in July 1995 he received the Inaugural Emergency Medical Services Exemplary Service Medal from the Governor General of Canada. Monte was an active member of the local Korean Veterans Association (KVA). The KVA is comprised primarily of members who served in the Canadian Armed Forces (Navy, Army, Air Force) in Korea during the 1950-1953 war and on peacekeeping duties in Korea from 1953 to 1955. He also spoke to a new generation about the meaning of remembrance day, service to country and sacrifice. Concurrently with all of this, Andrew remained an active member in the Royal Canadian Legion, where he served in every executive position at least once. In recognition of his service and commitment to community, Andrew received the Meritorious Service Medal. He began writing his 6 volume memoirs in 2006 and at the time of his death he had published 92 books. Autobiographical and historical fiction, his books tell of Canada’s growth into a nation. His humour, integrity and love of country resonate in every word. His service to Canada, community, friends and family was unending and he will be sorely missed by all. Ubique. Another hero lost, but never to be forgotten! For full details on the life of Monte. Tea/coffee, snacks available after the service at lower level of the church. We would love for you to share your wonderful memories/thoughts of Andrew during this time. In lieu of cards or flowers, we ask for you to donate to a charity of YOUR choice to show your love & appreciation for Andrew. Monte and I were great friends at Royal Roads. He talked me into being the literary editor of “The Log” of which he was editor. Good Grief! We lost touch as I went off into the Navy but I was honoured when many years later he contacted me for help when his daughter Trish had a child needing care at the children’s hospital in Halifax. We renewed our friendship. We stayed at his farm in Alberta, and this time kept in touch. He and Daphne stayed with us when he was taking an emergency medical course in the Maritimes. A real gentleman and model citizen but not much of a golfer – like me.